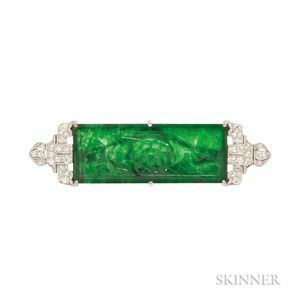 Art Deco Platinum, Jade, and Diamond Brooch, Raymond Yard, centering a rectangular carved jade plaque, diamond melee accents, signed, lg. 2 in., (hairline). Slight abrasions. Hairlines. Evidence of dye.